1. Ability to track sent e-mail campaigns: many of today's e-news software programs allow you to track details about your readers once the campaign is sent, such as pages they clicked onto, time of day they looked at your pages, length of time they spent on it, etc. This information is invaluable when you are looking at reaching your readers in the most effective way possible, and it also allows you to make changes for the next issue. You cannot get this from a blog unless you used advanced metrics and analysis from programs such as Google, and even then the feedback is more limited. 2. Developing reader loyalty and community: while it can take months or even a full year to develop loyal readers, many readers will look forward to reading your newsletter, and they also make an excellent focus group for you to test out new ideas, discount programs, surveys, etc. Subscribers often feel like they are "members," and therefore have more loyalty to your organization, versus a blog in which you may lose readers more easily. 3. Ability to segment your subscribers: may programs allow you to send targeted e mails to specific groups within your audience, such as new subscribers, or those who have responded to offers advertised in the past, such as affiliate links, etc. 4. E-newsletters are like mini magazines, in that they enable you to have theme issues, where you can focus on a guest interview, or profile a specific issue or individual. You can also make good use of seasonal or holiday messages, and use your list for multiple kinds of mailings, such as breaking news stories or a last minute sale item. 1. Select the program that works best for you and allow time to experiment before the deadline. There are many programs out there, such as Constant Contact, Cooler E-Mail, Patron Mail (used by many arts organizations and nonprofits), Aweber, and others. Many have free trials, and similar rates once you sign up, depending on the size of your list, frequency of mailing, etc. Make sure to check for features such as tracking software once the campaign has been mailed. Other important features include good customer service (someone should answer when you call! ), a variety of functional and readable templates, features such as polling and customer survey tools, good import/export software for your lists, and ability to schedule your campaigns on a given day and time. Be careful about uploading videos - some programs only allow a link to the file, and you have to go into the HTML code to embed a video. Finally, make sure you are comfortable with the formatting palette, as this is your bread and butter. When I was researching programs for carriefreelance, I clicked on the e-news provider each time a got a new newsletter in my in box, until I found the one that worked best for me. 2. Name your newsletter, and name it well. This is the name that people will be seeing in their in box, so if it merely says "News from the Widget Company," you will put people to sleep. If you are converting from print copy to digital, you can use the same name, but spruce it up with a new graphic or maybe a new twist so your readers can expect something different. You also want to be sure that the name clearly defines who you are, so your readers are not confused about whose e-mail they are receiving. 3. Prepare your stories ready in another program, such as Word, and number each story in the order it should be published in. While many people type directly on their templates, this is generally not a good idea, because if your file should get lost for whatever reason, you have no backup. Generally, about 5 stories of about 250 words each is a good start. I receive some newsletters that have only 2 stories, ( a bit lean for me) and others that are as long as 10 stories (too many articles). 4. Draw a thumbnail - or mini version of what the newsletter will look like before you start working on the computer. Even for a short issue, I find this has been really helpful in giving me an organized view of what the entire document will look like, and it can help me balance the photos, links, and other elements included. 5. Organize your artwork beforehand and keep images in a folder on your desktop. If there are images you know you are going to use, such as a headshot, business logo, event photos, etc., keep them all in one place so you can access them easily. It will save you time later. Note: the images should ideally be at least 300 dpi jpegs. 6. Once your newsletter is finished, proofread everything, send yourself a test version so you can make sure there are no formatting errors, and get ready to mail! Schedule your campaign carefully, keeping in mind that you might want to wait until the second week of the month to avoid that early month e-news rush we all experience. I know I get inundated the first few days of each month. I also generally stay away from Mondays and Fridays. Some experts suggest Wednesday afternoons as a good time to mail. 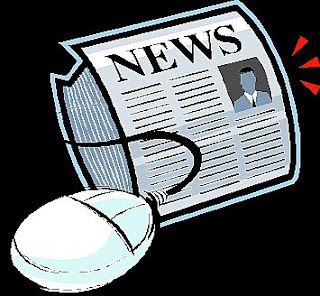 Have you recently launched a new e-news for your organization? What challenges did you encounter and how did you overcome them? I'd like to hear your story! In the meantime, good luck with your new newsletter!